Steiff Christmas Lladro Ornament Discounts Apply ! White, supple mohair. A friendly look from sparkling eyes. A delicate nose embroidered in gold: This little Teddy bear with ice-blue soles and golden, hand-embroidered claws, is a true charmer. 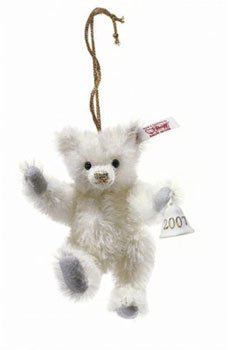 The simply decorated miniature bell by Lladr�, made of the finest porcelain, is securely sewn to the velvety-soft paw of the Teddy bear: It bears the year number 2007. She can be hung by her golden ribbon, a decorative eye-catcher - while helping her proud owner to find the perfect place to show her off.